Update: We have a review of the Amazon Fire TV Cube that you can read right now! After months of speculation, we finally have our first good look at Amazon’s upcoming streaming player, the Fire TV Cube, which is set for release in the US on June 21 – we expect it to appear in the UK and other markets in due course. 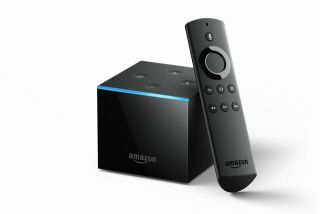 The device is a natural development of Amazon’s other TV-enabled media players. We already have the Fire TV Stick, a small dongle that connects to your home internet to stream online content services such as Amazon Prime Video, Hulu, HBO, and Netflix. There’s also the Fire TV, a square-shaped upgrade that can support 4K Ultra HD and Dolby Atmos. Both come with Alexa functionality, and the Cube looks set to take those capabilities even further, calling itself the “first hands-free streaming media player with Alexa”. Amazon seems to be betting on this combined functionality to sway consumers away from rival Chromecast or Apple TV devices. Much as on an Amazon Echo speaker, customers will be able to navigate Fire TV and play/pause/fast-forward content without the need for a remote, while still using Alexa for all their weather/shopping/trivia concerns. In contrast to the $69.99 Fire TV, the Cube will have its own Ethernet port, a larger 16GB of storage, and a built-in speaker – circumventing the need to use a TV's audio output. Users will also be able to control other compatible smart home devices, whether that’s additional speakers, soundbars, thermostats, or cameras around your home. The Fire TV Cube is retailing on Amazon for $119.99, with the option of including a Cloud Cam night-vision camera for a total of $199.98. Amazon hasn't announced prices for other regions yet, but we'd expect the basic Cube to come in at around £120 in the UK. If you're in the US you can pre-order the Fire TV Cube now.